R. T. Smith, writer-in-residence at Washington and Lee University, editor of W & L's literary journal, Shenandoah, and author of 13 books of poetry, is the recipient of the 2013 Carole Weinstein Prize in Poetry. Among Smith’s works are Messenger and Outlaw Style, both recipients of the Library of Virginia's literary award for poetry. His book In the Night Orchard: Selected Poems is due from Texas Review Press in 2014. His work has also appeared in Best American Poetry, Best American Short Stories, Best American Mystery Stories, and three volumes of the Pushcart Prize anthology. The National Endowment for the Arts, the Alabama State Arts Commission, the Wurlitzer Foundation, and the Virginia Commission for the Arts have granted him writing fellowships. 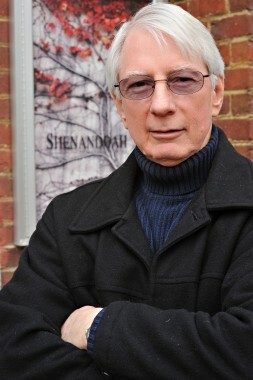 In 2008 Smith received the Virginia Governor’s Award for the Arts for his editing work at Shenandoah. Smith lives in Rockbridge County with his wife, the novelist and poet Sarah Kennedy, with whom he edited Common Wealth: Contemporary Poets of Virginia. The Carole Weinstein Prize in Poetry, established in 2005, is awarded each year to a poet with strong connections to the Commonwealth of Virginia. The $10,000 annual prize recognizes significant recent contribution to the art of poetry and is awarded on the basis of a range of achievement in the field of poetry. There is no formal application process or competition. Selection is made by a three-member board of curators. Taking place October 15–19, the 2013 Virginia Literary Festival celebrates Virginia’s rich literary resources with a series of events aimed at diverse literary audiences. The varied events include a writing workshop for teens, a movie screening, a book launch by a literary lifetime achievement honoree, an elegant luncheon featuring a three-course meal prepared with the cookbook Cooking with My Sisters and hosted by Adriana Trigiani and her family, and the annual Library of Virginia Literary Awards Celebration. The programs are offered at a variety of venues and most are free of charge. The Virginia Literary Festival promotes lifelong love of the literary arts through an annual series of educational programs and awards honoring Virginia literary achievements. For a list of programs and registration information, please visit www.literaryva.com/events.html. This August, the Library's Education department will take its show on the road. Many school districts simply can’t afford to send teachers to Richmond for professional development—so we are going to them. On August 13, Library staff will be in Tazewell County in southwest Virginia to offer a one-day seminar on how to use primary sources. We will repeat the program in Surry County in southeast Virginia on August 27. In each case, we will share documents from our archives that relate specifically to the locality. If these pilot programs prove to be beneficial, we will investigate ways to expand this service and help more teachers use our resources. Both programs are supported by a generous gift from Ellen and Orran Brown in honor of his parents, Anne and Ryland Brown, of Forest, Virginia. The fund is a legacy to their lifelong belief in the power of education to improve an individual’s well being and that of his or her family. Join the Friends of the Virginia State Archives on September 28 to welcome Dr. John Colletta as speaker at the 14th annual Richard Slatten Lecture to be held at the Library of Virginia. Based in Washington, D.C., Colletta has conducted workshops for the National Archives, taught courses for the Smithsonian Institution, and lectured nationally before genealogical, historical, and ethnic group societies since 1985. He has published articles in both popular and scholarly journals and magazines and contributed the chart "How to Find Your Immigrant Ancestor’s Ship" to a permanent exhibition on Ellis Island. His publications include They Came in Ships: A Guide to Finding Your Immigrant Ancestor’s Arrival Record and Finding Italian Roots: The Complete Guide for Americans. His book Only a Few Bones: A True Account of the Rolling Fork Tragedy and Its Aftermath depicts the fatal adventure of one of Colletta’s own ancestors, a man who moved from Buffalo, New York, to Rolling Fork, Mississippi, at the close of the Civil War. Colletta will present a well-rounded program of four lectures drawing on his years of research experience. His topics include passenger arrival records from the colonial period to the mid-twentieth century, a discussion of techniques for breaking through brick walls that often stop research, clues on how to evaluate evidence, and suggestions for how to prepare for successful research in European records. "Dr. Colletta is well-known for dynamic presentations," said noted genealogist Christine Rose, a previous Slatten Lecture speaker. "Well prepared, interesting, informative, and packed with knowledge, his lectures are always in demand." Registration information will be mailed in August. To receive registration information by e-mail, send a request to FriendsofVaArchives@gmail.com. Myths regarding the isolation and customs of Appalachians have endured since the late 19th century. Writers’ accounts have often focused on the sensationalistic aspects of the region’s culture, portraying its inhabitants as uneducated and prone to violence, rather than presenting a balanced and comprehensive view. Encompassing the time period from 1700 to 1950, this database provides access to diaries, journals, and narratives of Native Americans, emigrants, explorers, soldiers, and travelers. Also included are accounts of the development of farming and mining communities, folklore, and family histories. These texts provide a unique perspective on daily life in the vast region between Lexington, Kentucky, and Winchester, Virginia, and from Pittsburgh, Pennsylvania, to Birmingham, Alabama. Mountain People: Life and Culture in Appalachia serves students of American history, industry, education, religion, and more. The database comprises the microfilm collection First Three Centuries of Appalachian Travel in its entirety. In addition, a small number of selected titles are included from the microfilm collections Travels in the Old South I, II, & III: 1607–1860; Travels in the New South I & II, 1865–1950; and Kentucky Culture: A Basic Library of Kentuckiana. Your Library of Virginia library card is your key to exploring this exceptional resource. Stop by the Library to get a card today and visit the Library’s Using the Collections page to begin your research! With enrollment for the Affordable Care Act beginning on October 1, the Institute of Museum and Library Services (IMLS) and the American Library Association (ALA) have partnered with OCLC’s WebJunction to provide resources for libraries that will prepare them to assist citizens with questions relating to the act’s new Health Insurance Marketplace. Library staff will be able to participate in online educational webinars and will receive tip sheets and training in how to navigate U.S. government websites so that citizens can be guided to the best online resources to understand their health care options. The Library of Virginia will be working closely with IMLS, ALA, and WebJunction to ensure that Virginia’s public libraries and citizens are prepared for the important health care milestone. The Library of Virginia and the Virginia State Historical Records Advisory Board are collaborating to offer a two-day workshop on copyright issues for 30 archivists on October 28–29. The workshop will help archivists interpret and administer copyright in their daily archival work. William J. Maher, a leading expert on copyright and archival issues, university archivist at the University of Illinois at Urbana-Champaign, and former president of the Society of American Archivists, will lead the workshop. Maher will cover topics such as the Eldred v. Ashcroft Supreme Court ruling, whick upheld the extension of copyright for an additional 20 years. A commercially produced work is now governed by the provisions of copyright law for 95 years; for an individual's work, the term is "life of the author" plus 70 years. Registration is free for the first 15 registrants. In addition, a limited number of travel stipends are available for archivists traveling more than 150 miles to attend the Richmond workshop. Please note that you must be an archivist employed by the Commonwealth of Virginia to be eligible for this scholarship. To register for the scholarship, call Michelle Washington at the Library of Virginia at 804-692-3605. If you do not qualify for the scholarship, you may still register with the Society of American Archivists at http://saa.archivists.org/4DCGI/events/Register.html?Action=Register&ConfID_W=408. The cost for members of the Society of American Archivists is $285 or $335. Rates for employees of member institutions range from $325 to $375. Nonmember rates range from $365 to $415. This workshop qualifies for 1.5 general continuing education credits and 10 archival recertification credits. The Civil War Sesquicentennial has prompted numerous books and much reflection among scholars and the public about the war's causes, lingering impact, and aftermath. One of more interesting projects exploring the Civil War is the New York Times online journal Disunion, which uses original essays and commentaries from a diverse group of scholars, historians, and Civil War buffs—along with contemporary accounts, diaries, images, and historical assessments—to revisit and reconsider America’s most perilous period. The New York Times: Disunion, a collection of essays, biographies, and original articles on the significant events of the American Civil War culled from the website, will serve as the basis for a panel discussion on August 22, 6:00–7:30 PM, at the Library of Virginia. Exploring Disunion: History, Memory, and Virginia's Civil War Legacy will feature Dr. Edward Ayers, historian and president of the University of Richmond, Clay Risen, editor at the New York Times Disunion blog; Ed Sanders, head of interpretation, Richmond National Battlefield Park; Lauranett Lee, curator of African American history, Virginia Historical Society; and Robert H. Moore II, editor and administrator of Cenantua’s Blog, which offers "reflections on the Civil War–era South." The panel will explore how we remember the war; its meaning for Virginia; and its affects on the civilian population and on women, merchants, and enslaved and free blacks, in particular. Panelists will provide social and political context for understanding the events that threatened to tear the United States apart. The Future of Richmond’s Past is a cosponsor of the panel discussion. Copies of the book will be for sale in the Virginia Shop. As a part of downtown Richmond's First Fridays Art Walk on September 6, the Library of Virginia will host a program on the art of shape note singing, which dates to the post–Revolutionary War period. Shape note masters John del Re and Kelly Macklin will share some history of this a cappella musical form and, with a company of singers, demonstrate songs in the shape note style from works old and new. Afterward, the audience will be invited to join in and sing along. Historic shape note literature from the Library's collections will be on display, including a copy of the original Kentucky Harmony shape note tune book and other artifacts. A wine-and-cheese reception will follow the program, which begins at 6:00 PM.